At the 2009 NATA National Convention in San Antonio, TX , Wayne Northrup, CSCS, ATC (Assistant Athletic Trainer, Head Strength and Conditioning Coach/Instructor at Windward School in Los Angeles) donated blood at the NATA’s blood drive, as he does at every national convention he attends. That year something different happened. He was asked if he was interested in registering to be a bone marrow donor. The entire process of what would be involved to be a donor, and what it would be used for was explained to him. Without hesitation he agreed. Little did he know that four years later he would be the match for a perfect stranger. Three months ago Wayne was informed that he had been matched with a man in Germany suffering from Non-Hodgkin’s lymphoma. 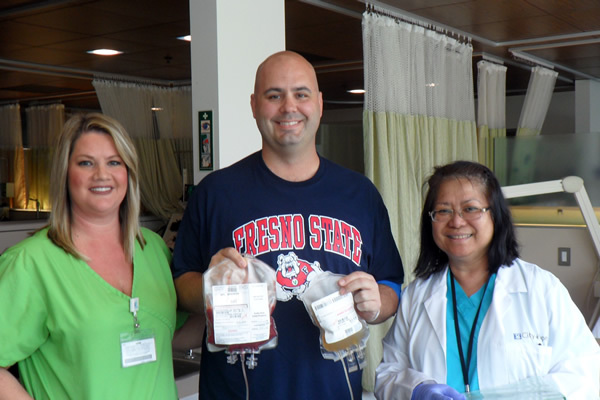 On October 28, 2013 Wayne donated his peripheral blood stem cells at City of Hope Hospital in Duarte, CA. Now this unknown recipient has a second chance at a healthy life. According to Lori Stancer, Donor Coordinator, City of Hope Hospital, over 12 million people are registered bone marrow donors. Approximately 10,000 people are waiting daily to be matched, and of that 10,000 about half will find a match. Those that are lucky enough to receive a donation have a 50%-60% survival rate. What makes Wayne’s donation even more special is that he didn’t become a donor because he was hoping to be the match for someone specific. He just did it out of the goodness of his heart. There are two ways to donate, bone marrow extracted from your hip or through peripheral blood stem cells (PBSC). Wayne’s recipient’s physician requested PBSC. Four days prior to his donation Wayne received a daily injection of Neupogen to increase his white blood cell count. The medication has a long list of side effects and burns when injected. Wayne experienced body aches and fatigue that increased in intensity each day. On day five, Wayne went to City of Hope Hospital and was hooked up to a machine that would extract the PBSC out of one arm and return the blood, minus the stem cells, to the other. The entire process took about 6 hours. 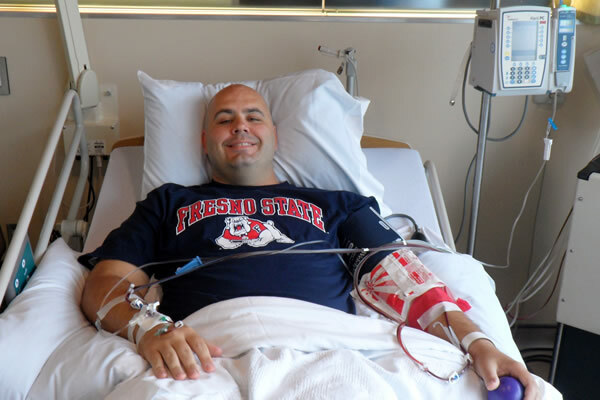 When Wayne was first informed he had been matched he knew immediately that he wanted to wear a Fresno State T-shirt while donating to pay homage to his alma mater. Now that his donation is complete Wayne says that he feels good about what he did, and even though he had to endure some aches and pains prior to and during the donation he would absolutely do it again if matched with another person. Wayne says the most memorable part of the experience was when he went for his physical and orientation at City of Hope Hospital. There he had the privilege to talk with several individuals that had been affected by all types of cancer. Two of the more memorable conversations took place with a bone marrow recipient and a woman whose family member was just put on the list days earlier. None of these conversations were intentionally set up. He was just approached by these people who saw him carrying around the donation literature. His advice to anyone who is considering becoming a donor?